About us Links Media Contests Next Meeting! 18701 N Frederick Ave. Gaithersburg, MD 20879. Please Note!! Our member John Hardison informed us that there are discounts for this restaurant. See the Links page for details. Please let Ken know if you are planning to read and bring enough copies to get comments. If you want the piece to be put up on this page send it to Ken (silverpenken@aol.com) or to Mario (mariosalazar@comcast.net). On the 4/2 meeting. All was well for our group last night in La Villa. Mario read more of his adventure story, Larry conveyed a really unique approach to Heaven and Hell, and Ken read an essay and a poem written on his trip to Jordan. 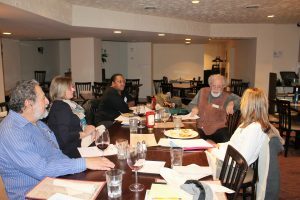 Our meeting on 3/19 had five participants. We enjoyed readings by Peggy and Mario. We also reread Larry’s piece about releasing Hitler from hell. We had two new members that we hope will continue to attend. 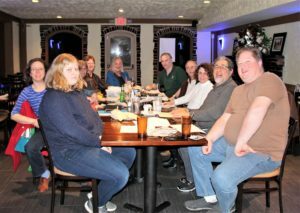 Our meeting last night (3/5/19)- eight members and four readers. Perfect! Larry TT had a new take on old Aesop, Trekkie John read a fanciful tale, Our Mario gave us valuable historical information, and Silver Pen Ken edged into race relations. Good discussions followed each one. 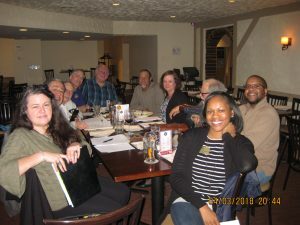 Ten people attended our meeting at La Villa 2/5/19. We enjoyed readings by four of those attending. Food was enjoyed by all. Larry Hodges returned and read an interesting piece about Hell closing out for good. Here is a photo of the group. We had ten participants on 2/5/19. 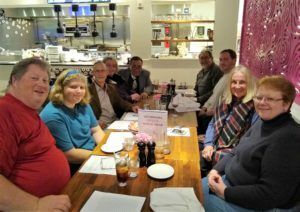 Nine people attended our meeting on 1/22/19. We had a new person, Pablo Guzmán and two members we have not seen for a while, Bill and Suzyn. Five members read and we had lively feedback. Twelve persons attended our 1/8/19 meeting. Ties our most attended. The highlight was John’s piece about …. well you ask him about it. We had a very well attended meeting on 12/4. We heard from five of nine writers. A good time was had by all. When we arrived to the Barking Mad last evening, a major rally for Governor Hogan was in full swing on the patio. It was a hard to find parking and even harder to push through the crowd to the door. We spoke of this and that and ordered from the waitress. Then, Mario read a memoir, hot off his printer. About the time we finished commenting on it, the Hogan rally ended and, and the cafe filled with people looking for warmth, food, drink and conversation. Carol read more of her Ghana story, loudly enough to be heard over the din, and there were several comments. Those ended when Lee, from the family that owns the Spectrum complex, including the cafe, saw our sign on the table and came to say “hello.” She is a journalist. Then, her husband, Peter, came to join in the conversation. As they were moving on, a Puerto Rican artist and writer, Alfredo, arrived to check out our group. The time for reading was over, and people drifted away, as Ken and Alfredo stayed to enjoy some good café americano. On May 1st we had six participants. We thoroughly enjoyed the company and the readings by five participants. Larry H delighted us with a short story about the last Pluter. Carol read the second chapter of her book. Marylou showed one of her recently published articles about a fabulous exhibit at the Barn in the Kentlands. Larry surprised us with part of his book about the lost pterodactyls. Mario continued the saga of a couple of the characters in “On the run”. 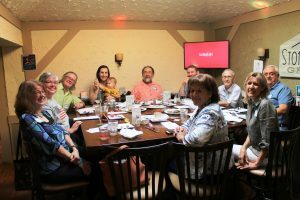 We had a very successful meeting on April 17. We missed some of you, but we had a great addition to the group, Carol Bouville. She delighted us with part of the first chapter of her novel. We had one of the better attended meetings on April 3rd. Heard from six of the participants. Regaled with both fiction and non fiction that made the evening very enjoyable. Here is a photo of the participants. Our group’s writers are meeting high standards. On June 21st, Ben read a fascinating one-pager entitled, “Beautiful,” she said,”And tragic.” Bill followed with an excellent piece that began: “She was lethargic and seldom spoke–a clear portent that her ancestors were beckoning.” Ken followed with a poem about acquaintance and impermanence, and then Mario’s ongoing story moved into the realm of a Latin gang. At one point, our waiter said something about “The Ancient Mariner,” and Ken spouted a verse of it. Bill knew the poem too and recited the opening verse. Newbies, Elizabeth and Sandy participated in the critiques, found things in common, and stayed after the meeting to talk about them. Writers attract writers. On March 21, 2017 we had an excellent meeting. The photo below shows us in the middle of it, from left: Rachel, Ken, Mario, Ben, Larry, Ellie and Dell. We also hosted a videographer from the city of Gaithersburg that came to tape Ken, as our host. Rachel, Mario, Larry, Ellie and Dell read from some of the projects they have going. Rachel is a newcomer, she has two more writing Meetons. The fare was good and the company better. We had a great meeting last Tuesday January 17. Six people attended. DelRica one of our new members sent me a link for a short story competition. The dead line is fast approaching. If you have that literary jewel, this is your chance. We enjoyed the company of : (from left), Arlene, Holly, Richard, Anna (with Henry), Mario, Matthew, Ken, Mo, Nancy and Vivian. A good time was had by all. Participants at our first meeting on 7/5/16.From left: Bea, Mario, Holly, Ken, Mo, Peter and Nancy.